Usually people get tired of their slow Internet connection or page not loading errors. For such issues it is always good to switch to best possible DNS available. A good DNS remove page not loading errors, download faster and speed up you Internet. Google DNS and Open DNS are some of popular DNS. Today we talk about Google DNS and how to implement Google DNS in Windows. We also talk about what is DNS, what is Google DNS, advantages and how to use Google DNS in Windows. First you need to know is What is DNS (Domain Name System). DNS is a naming system for services, computer and other resource which connected to either private network or Internet. It is like Internet phonebook which translate hostname into IP address to locate computers or other devices worldwide. Each domain has its own IP address. For example www.easkme.com or www.easkmedia.com has their own Ip Address, and server uses these IP addresses to locate website. Google has started a public DNS service that is Google DNS. This is an alternative of other current DNS that you have. This is a free DNS which make Internet faster. To use Google DNS you should know few things. 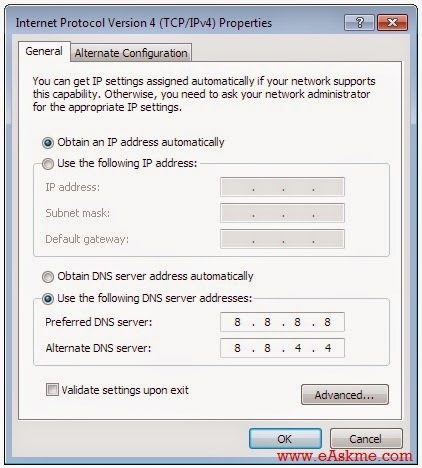 Here we show you all steps so you can use this DNS on your Windows. Click on "Network and Internet". Select Adapter Settings for windows7, if you use XP then go to "Control Panel" then click on "network and Internet Connections" and you will see Network Adaptors. In Networking tab change Version 6(TCP/IP) or Internet Protocol Version4(TCP/TPv4) or both of them. Click on TCP/IPv4 and click on "Properties". Go to "DNS" tab Select DNS servers and remove them all. Enter IP 8.8.8.8 for Preferred DNS Server" and 8.8.4.4 for "Alternate DNS Server" Then click Ok. Select For TCP/IPv6 and click on "Properties"
Tick on "Use the following DNS server Address and then click on "Advanced". Remove all if there any DNS servers defined already. Enter 2001:4860:4860::8888 for Preferred DNS Server" and 2001:4860:4860::8844 for Alternate DNS Server" and click "OK". Now you can use your faster Internet. If you use Google Public DNS then you should know that Google keep you IP address in records for 24 hours and keep your ISP and location information always. It also improve your Internet security. I prefer use Google DNS and Open DNS both at same time. You should use DNS benchmark tools to find which DNS working best for you.